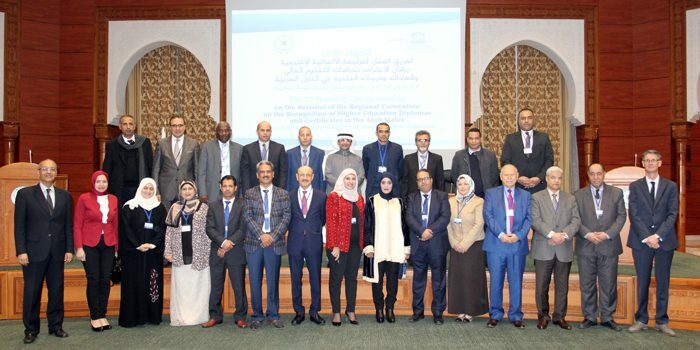 The 2nd Meeting of the Working Group for the Revision of the Regional Convention on the Recognition of Studies, Diplomas and Degrees in Higher Education in the Arab States kicked off today morning at the headquarters of the Islamic Educational, Scientific and Cultural Organization (ISESCO) in Rabat. The Meeting is being held by ISESCO and the UNESCO Regional Bureau for Education in the Arab States in Beirut, on 7-9 March 2018. At the meeting’s opening session, Dr Amina Al-Hajri, ISESCO Deputy Director General, gave an address wherein she reaffirmed ISESCO’s keenness to sustain cooperation with UNESCO to support and disseminate the outcomes of this Meeting to cover other areas of the two Organizations’ mutual Member States, especially in Asia and Africa. Dr Al-Hajri also said that in the past years, ISESCO paid special attention to this issue by launching a leading programme for student exchange called “TAFAHUM”, and overseeing, in cooperation with the Federation of the Universities of the Islamic World (FUIW), the follow up of the implementation to the performance indicators in Member States’ universities in order to ensure universities’ academic, administrative and financial quality, which is the key standards to recognizing any university degree. The representative of the UNESCO Regional Bureau for Education in the Arab States in Beirut, Mr Anas Bouhlal, also gave an address wherein he highlighted the importance of this Regional Convention and its preparation stages, commending the fruitful cooperation between the Bureau and ISESCO with regard to promoting higher education in Arab Member States. The meeting’s opening session was attended by Mr Sultan Abu Orabi Al-Adwan, Secretary General of the Association of Arab Universities; Mr Peter Wells, Chief of the Section of the Higher Education at UNESCO headquarters in Paris; as well as several directors and heads of ISESCO’s specialized centers. The meeting brought together sectoral directors, legal consultants and experts specialized in the issues of education, higher education and scientific research from Morocco, Mauritania, Algeria, Tunisia, Egypt, the Sudan, Saudi Arabia, Yemen, Qatar, Sultanate of Oman, Iraq, Jordan, Palestine and Lebanon. The Meeting’s agenda includes presenting the outcomes of the first meeting of the Working Group, held in Cairo, on 23-24 October 2017, and examining the general requirements to recognize higher education qualifications and diplomas, and ratify, accede to and enforce the Convention.